Finding the right items to include in a care package for boyfriends could be challenging. A care package is a box of treats packed with love. For a boyfriend, the goal is to send him a care package that will melt his heart. But, as with any gift-giving task, the question of “what do I get him” will eventually rear its ugly head. 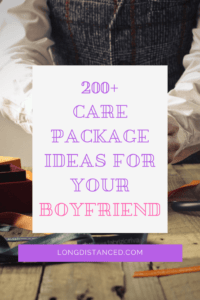 Rather than say something cheesy like “consider his needs, wants and preferences in putting together a care package for him, I have put together a list of over 200 brilliant Care Package Ideas for boyfriends. Hopefully, these romantic care package ideas will help you send him a heart-melting box! Add some items of sentimental value. In love with a food lover? One with a sugar-loving taste bud? Or maybe a healthy eater? Do you have a boyfriend in the army? Then you should check out our awesome guide on Military care packages. Now let’s hear from you, what are your favorite things to include in a care package for your boyfriend? DIY items or supplies that you could easily pick up at the mall? Do tell us through the comments section!